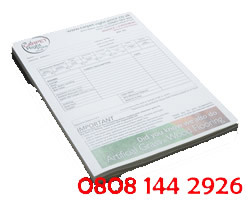 Low cost A4 2 part NCR sets, pads, books printing of one colour 2 part, 3 part or 4 part A5 ncr forms printed at trade printing prices dispatched on a next day courier service to England. A4 ncr invoice and order form printers of two part, three part and four part carbonless sets, pad and books at very low printing prices. Competitive printers of A4 2 part / 3 part / 4 part NCR carbonless set invoice order forms, invoices, receipt pads and books to England. Competitive low-cost one colour printing prices on a 7 to 10 day 1 colour ncr printing service. 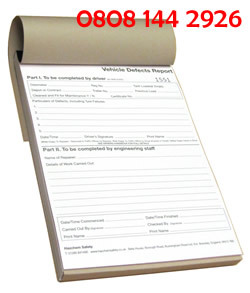 A4 2 part, 3 part or 4 part invoice sets, pads and books printed in one colour. 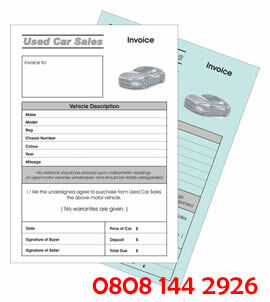 One colour one sided carbonless invoice forms, printed onto either 2 part, 3 part or 4 part carbonless NCR paper. 7 to 10 day printing prices based on basic artwork from supplied text file and logo. One colour A4 2 part NCR prices. A4 2 part sets- seperate sheets. A4 2 part pads - in glued pads 50 in a pad. A4 2 part books - with cover 50 in a book. A4 2 part pads of 50 sheets glued at top. A4 2 part books of 50 sheets with cover. One colour A4 3 part NCR prices. A4 3 part sets- seperate sheets. A4 3 part pads - in glued pads 50 in a pad. A4 3 part books - with cover 50 in a book. A4 3 part pads of 50 sheets glued at top. A4 3 part books of 50 sheets with cover. One colour A4 4 part NCR prices. A4 4 part sets- seperate sheets. A4 4 part pads - in glued pads 50 in a pad. A4 4 part books - with cover 50 in a book. A4 4 part pads of 50 sheets glued at top. A4 4 part books of 50 sheets with cover. Free A4 2 part ncr carbonless forms artwork proofing and client area.